This holster has a build-in belt tensioner and a jacket slot so you can wear your jacket between the belt loop and the pistol grip. Features covered trigger guard and fully leather lined. For medium-frame revolvers with 4" barrel and semiautos. Available in black, with plain or basketweave finish, or in high-gloss Clarino. Same as the H080 but rides 1.5" higher for a mid-ride style holster. 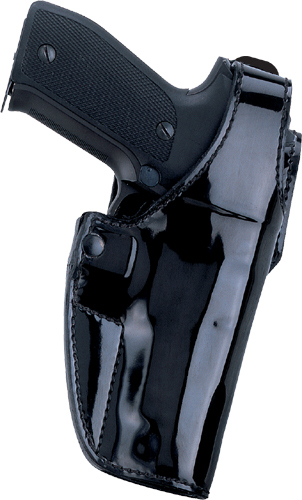 This holster features a conventional thumb break.